In this video, we're going to go through how to integrate Google Sheets into the new PT Distinction V3 software. If you're not in a position to watch the video right now below are written instructions. Inside a client or a group dashboard, click the green Add button. Go to Coaching, and inside Coaching, click on Spreadsheets. Title your initial spreadsheet, and then save it. Now you've set up your spreadsheet and you can put it into the schedule for the client or the group if you wish to. At this point, I'm just going to say no thanks. Once you've got the spreadsheet in the dashboard, go to the action drop-down and select “View”. It then brings up a page with a blank sheet, from here click on the green Google Integration button. You then get redirected to Google, select the account you want to use, and allow the permissions, then it lets you know that your integration has been successful. Now you can start working on your sheets inside PT Distinction. You can open your sheet inside a new window if you wish to, giving you the spreadsheet on a full page. You can also import any of your previously made Google Sheets directly into PT Distinction. If you're sharing sheets inside a group dashboard, it will copy the sheets for each member of the group, so each person has their own separate sheet and they're not all filling in the same one. 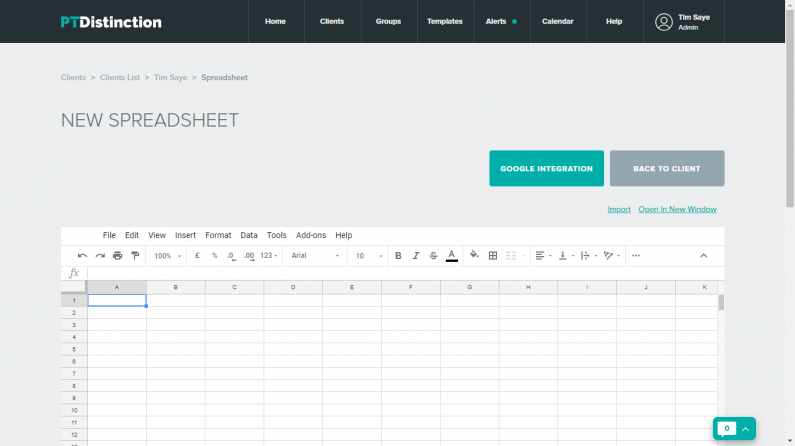 If you're creating a new sheet inside a client's dashboard, then only that client will get the Google Sheet.